It’s another all-Baen Books day for new books. Why? Because Baen keeps sending me a ton of books, that’s why! Tell me what here in this pile looks interesting to you. I wonder what the Three Faces of Asprin are–short stories or something else? I’ll have to check it out. 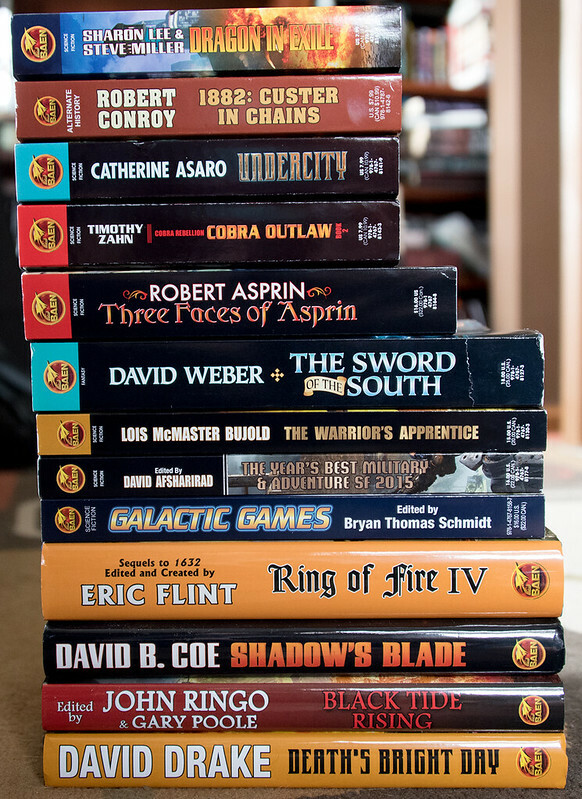 Robert Asprin, Timothy Zahn, and Galactic Games. I was interested to see LM Bujold’s The Warrior’s Apprentice in the stack since it was originally published years ago (2002? ), but it makes me want to read the whole Vorkosigan Saga series again. Love that little imp Miles, aka Admiral Naismith of the Dendarii Free Mercenary Fleet! The Warrior’s Apprentice had been part of a combo volume, Young Miles. I wonder why they’re bringing back the solo version. RJ, Sam Lubell: Warriors Apprentice is here because it has been republished as a 30th Anniversary Edition. Wow…you’ve had quite the heap of books coming in lately! Do you read them all?? And what do you do with them? can you donate them to libraries? I see Aspirin is taking lessons from Hubbard on keeping up your output under challenging circumstances. The Sword of the South begins the climax of Weber’s Oath of Swords. Again, not a place to begin reading the series and again, Oath of Swords is downloadable. For those who have read the adventures of Bahzell Bloody-Hand but haven’t read this one: it’s about par for the course, with a few new twists and a good bit of foreshadowing. Rather more wild wizardry than previously. Though not Our Gracious Host, at least yet. The Asprin has three stories, at least two of which were released as stand-alone novels back when. The Cold Cash War is pretty good, and I really like The Bug Wars quite a bit. Never read Tambu, but I’m looking forward to it. Galactic Games looks to be a mix of newer and older SF sports stories. The Great Kladnar Race is fun, and Run To Starlight is excellent. Haven’t read any of the rest, bu it’s a nice mix of authors. D.C. Sessions – Dragon in Exile is not an omnibus volume. It’s in the Ghost Ship -> Dragon Ship -> Dragon in Exile -> Alliance of Equals sequence. It’s the further adventures of Clan Korval rebuilding after they moved to Surebleak. Undercity is one of Asaro’s better novels. I stand corrected. (I have it, have read it, but was too lazy to check.) Thank you. I’ve already read Dragon in Exile, Undercity, Cobra Outlaw, Warrior’s Apprentice, and Sword of the South, and am about ¾ through Ring of Fire IV. I’ll check out Death’s Bright Day and Shadow’s Blade. Undercity and Ring of Fire IV look the most interesting to me. I’ve read most of the 1632 series and would love to add that one to my collection. Undercity! I’d forgotten all about this book. And that’s pretty sad when I’ve read everything else Asaro has written. Conroy: Alternate reality can be interesting at times but can also be used to avoid building a good story/world. I’ve read all his previous books and this one is his last chance. Zahn’s Cobra series: I have developed a suspicion of series as so many of them become an exercise in cashing in on the name. Nothing new happens. And now to contradict myself; I like Bujold’s Vorkosigan series (Warriors Apprentice was the first of her books I bought) and the 1632 series is helped by the number of authors who’ve inhabited it. Asprin: I haven’t read any of his work for a decade or two but may have another look. Asaro I’ve never read but enough people here and elsewhere have said good words so in my search for new authors I’ll try one of hers. I’ve already read most of those. Some of them are in that ARC stack because they’re paperback releases of last years stories. Others I’ve read from the E-ARC, like Death’s Bright Day. All of the ones I read were very enjoyable. Probably the Drake. 30th anniversary for Warrior’s Apprentice? Time flies. Ring of Fire! And Timothy Zahn, good books. Conroy not so much–his “1901” was incredibly insulting to Germans in general and had some really poor research (for example, America was actually on pretty good terms with the Kaiserreich before the Kaiser started unrestricted submarine warfare in the Atlantic), and his other books…well, they’re strictly formula. Big bad foreign county attacks America and must be driven back by a ridiculously fast-advancing American army. My advice is skip him, get more Zahn and Flint. KiwiSteve: Conroy died a year and a half ago and 1882 came out more than a year ago. Not sure why it was sent now. Either way, Conroy’s alternate histories have come to an end. They weren’t incredible books that stay with you a lifetime, but everyone one was enjoyable, if predictable. I’ll miss his annual addition to my library. You’ve probably already answered this question but what do you do with all these books? I must confess to a grudging admiration for authors who can write faster than I can read. As Stalin said, sheer quantity has a quality all of its own. I’m definitely going to have to get the Asaro. I’ve only read a handful of her stuff, but I’ve greatly enjoyed all of it. And I think my copy of The Warriors Apprentice may be about to give up the ghost from overuse and lending, so this release is well-timed. I’m curious about the Aspirin, but I think I’ve read most of his stuff, so it’ll depend on what’s inside. Galactic Games is a title that’ll get a closer look from me just based on the name. Mr. Zahn’s still writing Cobra books? I loved them!